The 930XC family of OTDR’s provides testing capabilities for all singlemode and multimode applications. Whether it’s provisioning, new installations, or troubleshooting the most difficult fusion splice loss, the 930XC OTDR capably locates and quantifies the distance to fault, insertion loss, and reflectivity. All saved files are in the industry standard SOR file format for easy documentation in the Greenlee trace viewer. Each OTDR comes standard with an optical power meter, visual fault locator, and a stabilized laser source so that the technician has all the tools necessary in one convenient package. The 180XL visual fault locator allows the technician to quickly and visually locate macrobends, dirty connectors, and pinched fibers. The 7km reach provides the capability to visually confirm fiber continuity as well. The 930XC-20M-UPC-SC is an easy to use, full-featured handheld test instrument that is capable of measuring the length to a fault or the length of singlemode and multimode fiber optic cables. 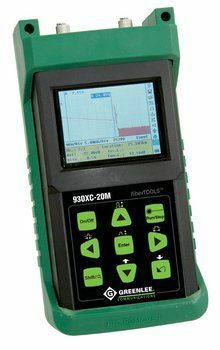 The 930XC-20C-APC-SC is an easy to use, full-featured handheld test instrument that is capable of measuring the length to a fault or the length of singlemode and multimode fiber optic cables. The 930XC-30F-APC-SC is an easy to use, full-featured handheld test instrument that is capable of measuring the length to a fault or the length of singlemode and multimode fiber optic cables. The 930XC-30P-APC-SC is an easy to use, full-featured handheld test instrument that is capable of measuring the length to a fault or the length of singlemode and multimode fiber optic cables.